File photo by Mike DuBose, UMNS. United Methodists, including Beatrice Gbanga (seated at table), medical and health coordinator for the church's Sierra Leone Annual Conference, help spread the word about Ebola during the kickoff for the national Maternal and Child Health Week at the soccer stadium in Bo, Sierra Leone, in June. Muddled messages and misinformation have complicated efforts to contain the deadly Ebola outbreak in West Africa. The United Methodist Church is responding with a communications strategy aimed at saving lives and reassuring people of God’s presence. The effort began when cases of the virus surfaced in Sierra Leone in June, after the initial outbreak in neighboring Guinea. Church officials in Sierra Leone and, soon afterward, Liberia, began spreading the word about how to fight the disease. Despite those initial efforts, governments in the affected countries were slow to mount a serious response. A lack of information and education in local communities, compounded by distrust and denial, exacerbated the problem. That allowed the virus to explode and claim nearly 1,000 lives in four countries. Responding to the need for information, United Methodist Communications is working with bishops in Sierra Leone and Liberia, and has been in contact with others in Nigeria and Côte d’Ivoíre. The church’s messaging strategy includes use of traditional media as well as emerging technology such as texting. Banners, posters and photocopies of messages that aid in the prevention, diagnosis and treatment. Radio airtime for messages that address prevention and care as well as the pastoral needs of affected communities. Data access through mobile carriers for sharing health and pastoral messages. Mobile texting can reach large numbers of people for whom cellular phones are the primary means of communicating. In Liberia, for example, the telecommunications market is almost entirely wireless, with 69 percent of the users relying on mobile phones compared with only 7.4 percent penetration by computers, according to BuddeComm. In Sierra Leone, 67 percent of the people have cell phones, compared with 1.6 percent who own computers. United Methodist Communications is working with partners that can provide the means for mass mobile texting across regions where infrastructure might be minimal. In addition, through voice-based mobile technology, messages can be shared with people who are illiterate. The grant money also could support “town crier” outreaches, in which young people with megaphones go through villages sharing important information. Before the outbreak became global news, United Methodists in parts of West Africa were building awareness of the threat. The church warned health care workers at Mercy Hospital near Bo, Sierra Leone, to treat everyone who came in as if they might have Ebola. In early June, during a celebration to kick off the distribution of more than 350,000 insecticide-treated bed nets in Bo, the church pushed out the message about Ebola while talking about malaria. 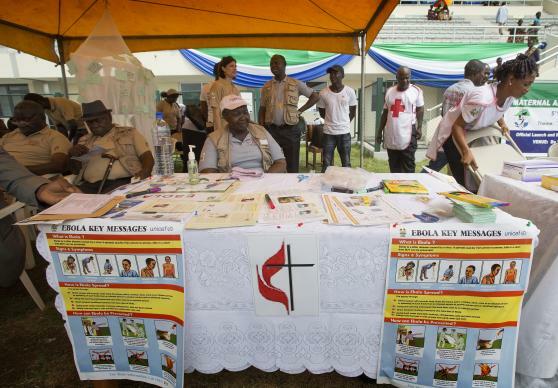 United Methodist Bishop John K. Yambasu, at another large gathering for the opening of a church, emphasized the message again: Ebola is real. Ebola is here. “In the absence of any ‘known cure’ for Ebola, we have focused on prevention education through radio programs, banners and training of health workers and heads of religious bodies as a way of spreading the Ebola message across the country. So far this has been a most successful approach,” Yambasu said in a message to United Methodist Communications. In Liberia, the church began broadcasting messages through its radio station to counter rhetoric about Ebola being divine punishment on the country. The church’s message is that God is here to give hope, said Liberia Bishop John Innis. Both Innis and Yambasu are urging people to take all precautions advised by the government and health officials. The church in both countries has been working with the government as well as other faith organizations in providing messaging. Last week, on Aug. 8, the World Health Organization declared the outbreak of Ebola in West Africa an international health emergency. Leticia Linn, communications officer for the WHO Regional Office for the Americas, said interpersonal communication and engagement with communities are keys to getting people to take action to prevent Ebola. Engaging local, religious as well as traditional leaders is also important. “An example of that strategy in Liberia, for example, (is that) the traditional chiefs of the 16 tribes have recorded several radio messages in different languages telling their people to take steps to avoid Ebola,” Linn said. In the United States, the Centers for Disease Control and Prevention has comprehensive information on Ebola on its website. Downloadable resources tailored for the West Africa outbreak include radio spots in local languages, posters and brochures. USAID announced last week its support of outreach campaigns — via radio, text messages and the local media — to provide Ebola information to the general public and health workers not familiar with the disease. Concerned about the spread of Ebola in Africa, the Christian Council of Ghana has called upon its Ministry of Health and organizations such as WHO to “deliberately intensify” public education about the disease and strengthen health systems. “As a council, we consider Ebola as a disease and not a punishment from God as some people are reportedly describing it,” wrote the Rev. Kwabena Opuni-Frimpong, a Presbyterian minister and the council’s top executive, on GhanaWeb. The Ebola outbreak follows a communications relief effort by United Methodists in the months following Typhoon Haiyan, which struck the Philippines in November 2013. Teams led by United Methodist Communications, and with the support of the Philippines bishops, have helped restore Internet connectivity and provided aid agencies with tools to coordinate relief efforts and identify needs.